The creation of a movie from a novel is a frequent occurrence these days, and movie novelizations are even more common. But how often does a book out of classic English literature become a musical experience? The late English professor James Hurt, who taught at the University of Illinois for more than 35 years, did precisely that. 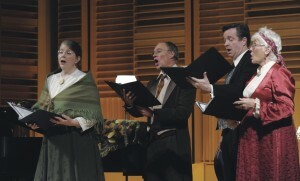 By breathing new life into the works of James Joyce, he turned his deep affinity for Joyce’s literary works into a unique musical experience. Around the late 1970’s, Hurt and a group of performers, including his then-wife and Northeastern Illinois University (NEIU) emeritus professor, Phyllis Hurt, began performing the Joyce of Music. The Joyce of Music was first recorded in 1982, and included some of the narratives from Joyce’s works: The Dubliners, A Portrait of the Artist as a Young Man, Ulysses and Finnegan’s Wake. In remembrance of her late husband and in honor of Joyce’s 131st birthday, Phyllis Hurt, along with some of NEIU’s music faculty and James Hurt’s sons, Matthew and Christopher, performed the Joyce of Music at NEIU. Each portion of the show included a small reading from the actual books, which gave the audience a sense of storyline. After a reading, several songs would accompany that portion of the production. Joyce was an Irish novelist and poet best known for the literary works featured in the Joyce of Music. Joyce was also well-known for his usage of the “stream of consciousness” which narrates the character’s thoughts. Joyce’s Dubliners consists of 15 short stories published in 1914. The stories deal with themes of Irish nationalism, Irish middle class, and character epiphanies. A Portrait of a Young Man was published in 1916 and can be described as an autobiographical fiction that uses a character named Stephen Dedalus to portray Joyce’s fictional alter ego. Ulysses was fully published in 1922 and depicts the life of a character named Leopold Bloom who resides in Dublin, Ireland. Joyce’s writing in Ulysses significantly resembles Homer’s Odyssey in terms of characters and events. Joyce’s final literary work, Finnegan’s Wake was published in 1939 and is divided into four books. Joyce’s signature use of stream of consciousness, allusions, as well as free dream association gives the story a lack of sense of plot. The Joyce of Music had a few songs that made the audience chuckle, like The Jewel of Asia composed by James Philp, and My Girl’s a Yorkshire Girl composed by C.W. Murphy and Dan Lipton. However, the song that received the most laughter was a traditional Irish song called Hooligan’s Christmas Cake. “There was plum and prunes and cherries, and citron and raisins and cinnamon too, there was nutmeg, cloves and berries, and the crust it was nailed on with glue. There was caraway seeds in abundance, sure t’would build up a fine stomach ache, t’would kill a man twice after ‘ating a slice of Miss Hooligan’s Christmas cake.” The Joyce of Music can be understood as like Miss Hooligan’s Christmas Cake; it includes a little bit of everything. It not only served as a form of entertainment, but as a revival of music, James Joyce, literature and the late James Hurt.